Perhaps the most badass villain in this universe is Darth Vader, and that’s the reason why DIYers have created so many projects revolving around this Star Wars bad guy. Above is one creation that turns this super villain into a mean machine of destruction on wheels. Made by Gabriel Dishaw, this unusual Darth Vader sculpture, called ‘Tank Vader’, is a miniature tank with the head of Star Wars’ most feared character. Made from a variety of recycled materials, including parts from a toy tank, computers, typewriters, adding machines, typewriters, toy airplanes and vintage model pieces, this is a work of art worth appreciating. Gabriel has put his piece up for sale for $1000. Find out more and see additional images over at DamnGeeky. A great item for a green star wars fan (who has some money to spend). I am starting to see a trend of people putting together art with recycled goods which adds value to it. Perhaps the most badass villain in this universe is Darth Vader, and that's the reason why DIYers have created so many projects revolving around this Star Wars bad guy. Above is one creation that turns this super villain into a mean machine of destruction on wheels. 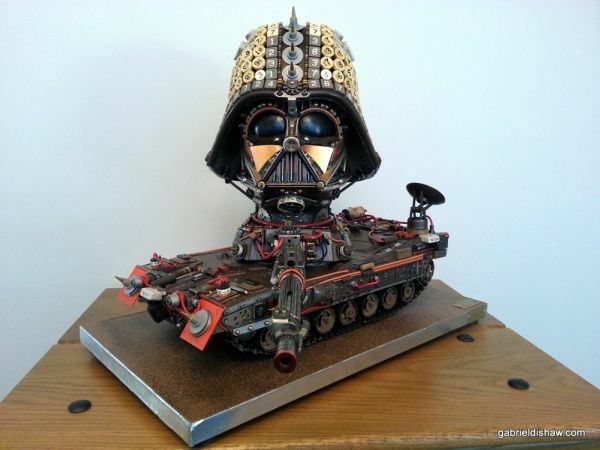 Made by Gabriel Dishaw, this unusual Darth Vader sculpture, called 'Tank Vader', is a miniature tank with the head of Star Wars' most feared character. Made from a variety of recycled materials, including parts from a toy tank, computers, typewriters, adding machines, typewriters, toy airplanes and vintage model pieces, this is a work of art worth appreciating. Gabriel has put his piece up for sale for $1000. Find out more and see additional images over at DamnGeeky.